We hope that some of our readers were able to take advantage of the e-resources trials publicised here which were available throughout March; do let Lydia know if you have any comments, and remember that e-marifah.net trial from the Middle East centre, which we mentioned on Facebook on the 14th March, is still available until April 27th. We will keep you posted with any other trials which we decide to run in the future! A small-ish move has taken place during the last couple of weeks; the “Z” books – Z.Arm, Z.G, Z.T, Z.Sov, and Z.C, which used to reside on the tiers opposite the Library of Congress Folios at the Sacker end of the library have been moved down three rows to the space vacated by the Japanese books last year in order to expand the shelves of folios. This is because Kate is currently working on the PJ folios – a quite extensive section – and was concerned about running out of space. We will be re-thinking this area of the library and there will be further moves of the Z.Per journals (which will go with the rest of the journals over by the photocopiers) over the Long Vacation. In the meantime, if anything you need has vanished without trace do come and ask at the desk! The shelves are labelled, and nothing has gone very far at this point. We are pleased to report that the router, which had been faulty for some time, has now been replaced and that the Bodleian Libraries Wifi is now available again. EduRoam and OWL are also available for those who prefer to use them, and the signal should be better now that we have a router in the library again. Thanks to all of you for your patience! As usual, the whole Oriental Institute building will be closed from Thursday 13th April to Monday 17th April inclusive. The Library will be open until 7pm on the Wednesday 12th, but the rest of the building will close at 5. Other Bodleian Libraries are open on Thursday 13th. Additionally, the Library will close at 5pm on Tuesday 18th April, before normal opening until 7pm resumes from the 19th. We will post reminders on the Facebook page nearer to the time. This entry was posted in Electronic Resources, Opening Hours, Re-organising the Library on 4 April 2017 by katieguest. Another quiet but busy month in the Oriental Institute Library; we have been pleased to see how popular our Facebook link to the new blog post about the Digby collection has been – for those who missed it you can find it here: http://wp.me/p5Eblf-ZQ. 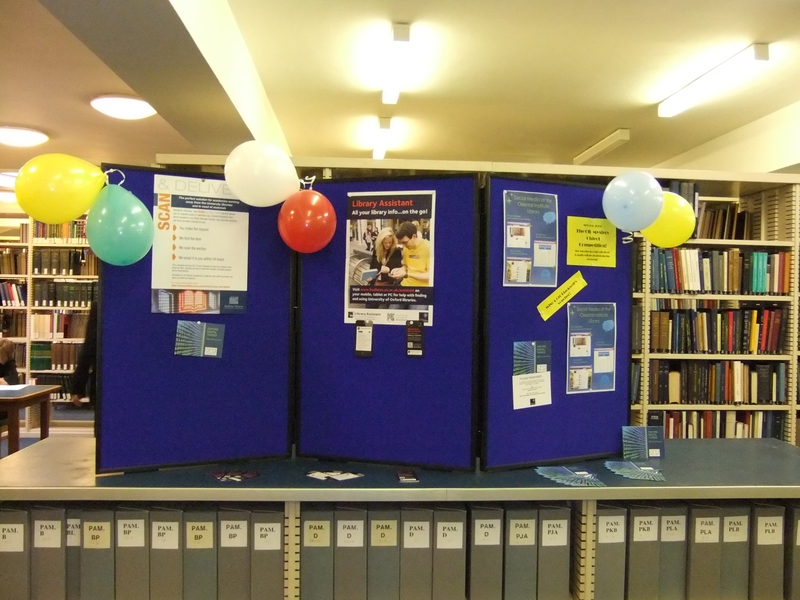 Of interest this month has been the exciting trial of new e-resources, mentioned in our previous post and now with its own display just inside the Library door. We hope our readers are taking advantage of these resources which are all available via OxLip+ until the end of March EXCEPT for the Early Arabic Printed Books resource, which is available until the 10th. Don’t miss the chance to try them out! While the Bodleian Libraries wifi issues appear to have been resolved for now, we have been asked to inform readers that the infrastructure is being migrated to a new platform on the 7th March (Tuesday of 8th Week) and that the service will be unavailable for a short time while the migration takes place. Eduroam and OWL will still be available to readers during the outage. Long loans for the Easter vacation will commence on Tuesday 7th March and from then on all books checked out or renewed will be out until April 25th (Tuesday of 1st Week). If you have books which you want to keep for the vacation do remember to check that you can renew them – remember only three renewals are permitted before the books must be returned to the Library, so don’t get caught out! If in doubt, a member of staff can help. The Library will be closed over the Easter long weekend from Thursday 13th to Monday 17th April inclusive, but we will otherwise be operating our usual hours over the Vacation. A reminder of this closure will be posted nearer the time. Once we are out of Term we are planning another of our small book-moves, this time in the Reference Section at the far end of the ground floor. This will involve moving the “Z.” shelfmarked books which came here from the New Bodleian into the space vacated by the Japanese Reference books, and is necessary in order to increase the space for the Folios which are currently just on the last two bays along the back wall. Kate is imminently going to be reclassifying the PJ Folios and is concerned that there is not enough room in the current Folio section to accommodate them and the PK Folios (which she will reach within the next few months if she carries on at her current speed). This entry was posted in Electronic Resources, Loans, News, Re-organising the Library, Vacations on 1 March 2017 by katieguest. November saw things settling down a little from the beginning of Term, but we have still seen many new faces and enjoyed meeting all the various people who are now using the Library. 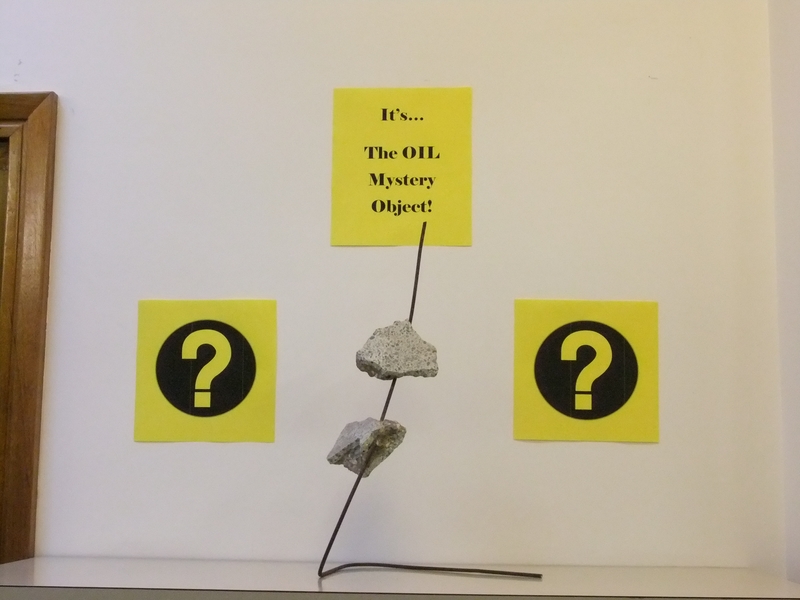 As always, do ask us if you can’t find something; we know that the set-up here can be a little confusing! Term is still upon us for the next week, so we would encourage anyone who hasn’t to enter our “Name the Stapler” competition, a winner of which will be announced on Friday. Vacation Loans are now in operation, having started on Saturday 28th November; books borrowed from then on will be due back on the 20th January (Tuesday of 1st week). We are running a Research Skills Toolkit session on Thursday 4th December – there are flyers at the front desk for anyone who is interested in attending and learning more about this valuable resource. We will be doing some reorganising in the Library of Congress section over the vacation, moving books up into the spaces vacated as Kate has been reclassifying the collections, so may be making a bit of noise and/or leaving the desk for periods of time, but there will be someone around in the office and we will leave a note telling readers where we are. This is essential work – there is no more room in certain sections due to the volume of material being added – so we beg your patience for a few weeks until we can get things back to something resembling order. And finally, the Library closes for Christmas on the 23rd December at 5pm, re-opening on Monday January 5th at 9am. This entry was posted in Electronic Resources, Fun, Loans, News, Opening Hours, Re-organising the Library, Vacations on 1 December 2014 by . Firstly, and most importantly for those of you who hadn’t realised, the Library now opens at 0900 rather than 0915, allowing an extra quarter of an hour a day for all that essential reading! The OIL open day for new students (and anyone else tempted by the sweets) was held on the afternoon of Friday 10th October and was well-attended, with many of the students staying behind after the introductions for training on SOLO, PCAS and other library-related matters, and also to sample the abovementioned sweets, generously provided this year by Dinah Manisty and Alasdair Watson. Alasdair also made himself available to talk to people about Arabic Manuscripts, and had an interesting slideshow on his laptop showing some fine examples. Kate hinted during the introductions that there would be a new competition for Michaelmas Term, the final announcement of which was delayed by a week due to operational matters (she and her colleague at the Humanities Theses desk, Rob Wilkes, moved into the Weston Library from Osney Mead on the 16th October and things were a bit hectic for a few days). 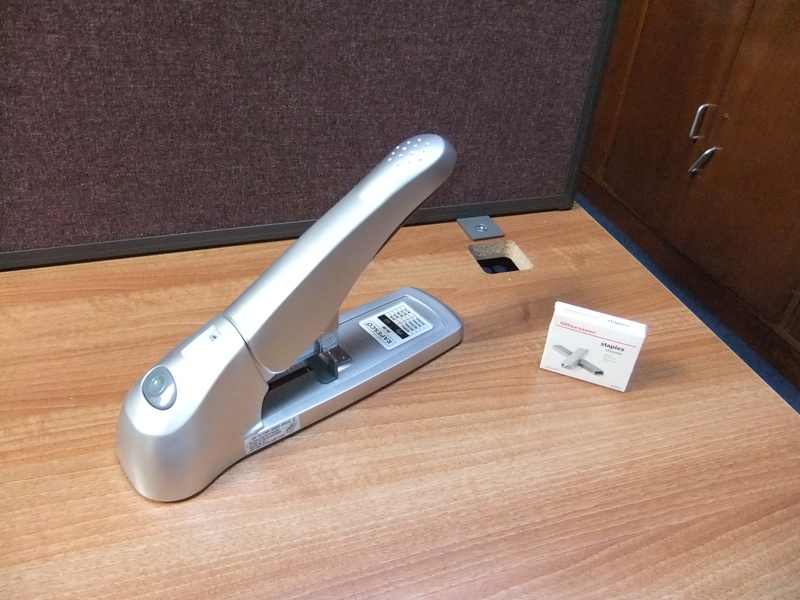 We have now, however, launched the “Name the Stapler” Competition – see posters at the Library desk or the previous blog post for details. We hope to have a good number of entries before the competition closes in 8th week, so get naming! We welcomed Dawn back from her trip to Australia on the 20th – it sounds like she had a lovely time! Dinah has asked that we pass on information about the following exciting new electronic resources which are available to Library users. 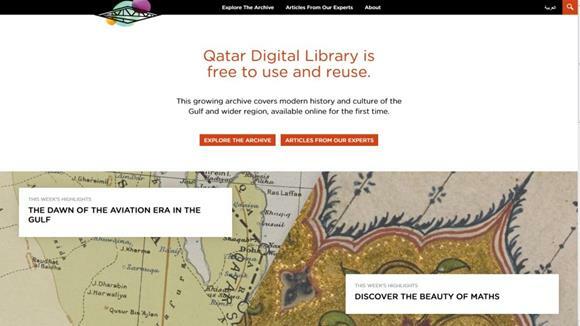 Firstly, there is the Qatar Digital Library Online portal at the British Library, a great new archival resource on the region. The QDL has been developed as part of a 10-year Memorandum of Understanding on Partnerships between the Qatar Foundation, the Qatar National Library and The British Library. A wide range of content from the British Library’s collections (more specifically their colonial archives related to the Gulf Region) have been digitized since 2012, reaching a total of 500,000 images that will be available to browse and search by the end of 2014. The Qatar Digital Library (QDL) is making a vast archive featuring the cultural and historical heritage of the Gulf and wider region freely available online for the first time. It includes archives, maps, manuscripts, sound recordings, photographs and much more, complete with contextualised explanatory notes and links, in both English and Arabic. This archive is bound to transform the study of Gulf history, improving understanding of the Islamic world, Arabic cultural heritage and the modern history of the Gulf. You can find more info on the Qatar Digital Library at http://www.qdl.qa/en/about. Try it for yourself (Qatar Digital Library portal) and please let the students know about this great (and free!) new resource. Dinah is responsible for this side of the Library’s work, so do let her know if you have used these and whether you have any feedback to give; we try to keep up as best we can with the latest resources which are available, but if any of you know of any we should have and don’t, please do get in touch! As we said, a bumper post for October! We hope for more of the same in November! This entry was posted in Electronic Resources, Fun, New Accessions, News, Opening Hours on 31 October 2014 by . April was a busy month for the Library! Various subtle changes have been afoot while most of our readers were off enjoying the Easter Vacation (and yes, we know a lot of you were revising for exams). Most obvious are the adjustments which we have made to the shelving arrangements in the Library of Congress Section, where the large folio-sized books have been moved to the back walls of the two last bays at the far end of the section towards the windows. This move is designed to allow the rest of the LC section to gradually move towards that end of the library and round to occupy the space currently used for the old D sequence, which is gradually diminishing as Kate works on it. Some of the LC books are now on the shelves under the windows, in the space where the last of the BPs were, and the sequence will continue to move up as and when the space is available. As those of you who use the Reader PCs will note, during the vacation they were upgraded to Windows 7. The basic functionality should remain the same but the appearance will be slightly changed. Staff PCs have also now all been upgraded, too, so hopefully there will be no further disruptions, although we did have a bit if a wait for some extra applications to be installed. This work was necessitated by the fact that Windows XP, which all our computers had been running on up until now, is no longer supported by Microsoft, occasioning the IT department to have to upgrade the whole University of Oxford in a short time. Given how much they had to do, we are grateful that everything appears to have gone as smoothly as it did! No other news right now (and I am rushing to get this out as it’s rather late), but just a reminder that we are open as usual on the next Bank Holiday (May 26th). This entry was posted in Electronic Resources, Library of Congress Collection, News, Re-organising the Library on 6 May 2014 by . Following a successful trial in Trinity Term 2013, Oxford readers now have access to over 84,000 extra e-books in the Ebrary Academic Complete collection. The books come from 500 prestigious academic publishers and range across all disciplines. The books are all displayed and searchable on SOLO http://solo.bodleian.ox.ac.uk/ or in OxLIP+ as Ebrary Academic Complete (you will need your SSO – single sign on username and password). The ebooks are mounted on the ProQuest platform with multiuser access and University members also can download ebooks for a period of 14-days onto mobile devices. The package will be updated regularly. Our subscription runs until August 2015. Publishers include OUP and other UK academic presses, various US academic presses (e.g. Yale, Princeton, Harvard), Brill, Garnet, Sage, Routledge, I.B. Tauris and many more. This entry was posted in Electronic Resources, Services on 16 September 2013 by . Next Wednesday, 16th January, there is a workshop on The Brill Online Islam Package as a Research Tool at the Radcliffe Science Library from 1400-1600. The package includes many useful resources including the Encyclopaedia of the Quran online, the Index Islamicus and the Bibliography of Arabic Books online. 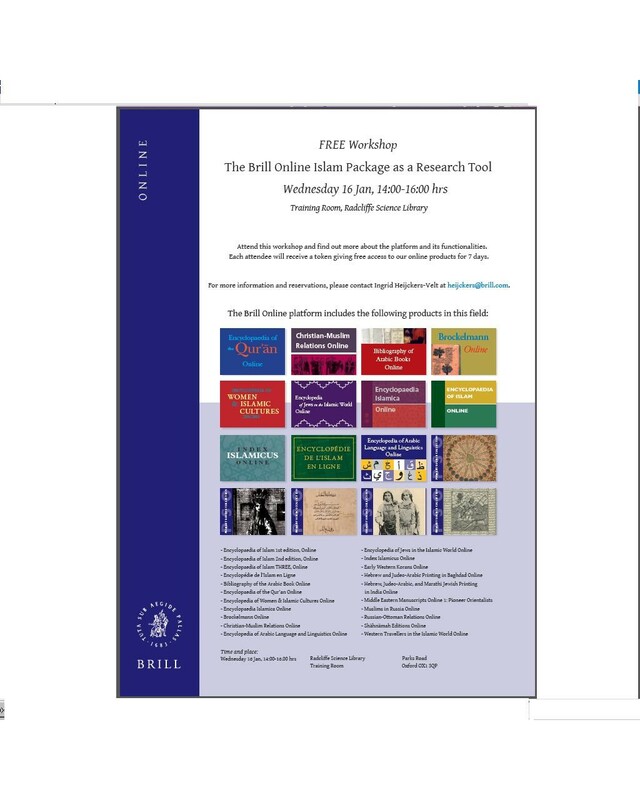 Places are limited, and attendees will be given a token which allows FREE access to Brill’s extensive online resources for 7 days, which is a real incentive. Email Dinah Manisty (dinah.manisty@bodleian.ox.ac.uk) to book a place. This entry was posted in Electronic Resources, Islamic Collection, Services on 11 January 2013 by .